Can you imagine? Instead of looking forward lo the weekends, 1 in 7 New Jersey kids fear them. They’ll face hunger until Monday. That’s unacceptable. No child should have to head home for the weekend knowing they’ll have nothing to eat. 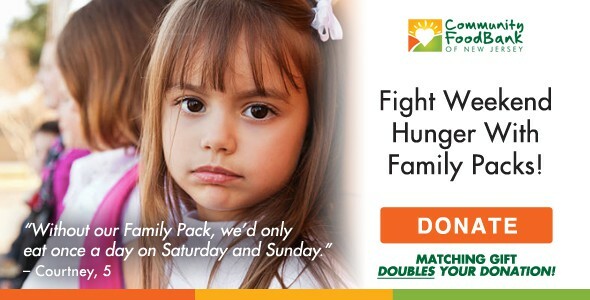 Thanks to a very generous friend of the Community FoodBank of New Jersey, any gift you send will be matched dollar-for-dollar -up to $5,000 – until September 30.
in the fight against hunger across New Jersey.